« When all of Highbury told the football authorities where they could put their 2 point deduction. 1921/2 had been a dreadful season in which Arsenal had almost gone down to Division II. A look at the final table does not really reveal the closeness of the disaster, and in reality Arsenal’s survival was as much down to the failures of Bradford City and Manchester United at the end of the season as anything else. So we might have expected some new blood in the squad, and to examine this I’ve created this chart showing the eight players who made their first appearance for Arsenal in 1922/3 – the season we start to consider within this article. Three of these players were brought to the club in previous seasons (Townrow, Robson and Mackie) and the last two of these made an impression this season, and for some years to come. Kennedy was signed just as the season ended and he too played over 100 games, and continued in the squad under Chapman. But the real prize was the transfer of Bob John from Barry Town in June 1922, a man who turned out to be a sensation for Arsenal and the first signing of a player who played in the squad that went on to win trophies. We could be cynical and say that with this many signings Knighton had to come up with a real gem sooner or later, but that would be churlish. He and his scouts found the man playing non-league football and signed him up and that should be recognised. This is not to agree with Knighton’s assertion that he was left scrabbling for players where ever he could find them. Finding players at lower league clubs who could step up is part of a manager’s business. Knighton did it on this occasion. Sadly of the remaining three players signed during the season, none shone in the Football League, but that only serves to highlight just what a player Knighton found in John. And how wonderful for Bob John it must have been when Chapman came along and he continued to serve in the team. So four newcomers shone in the months ahead: Robson, Mackie, Kennedy and John. Would it be enough? As the country waited for the traditional pre-season friendly between the reserves and the first team (which I suspect took place on 17 August, although I haven’t found any formal record of it), so Dublin Castle was prepared to be handed over to the Irish Republican Army as the final British troops left Irish soil. The handing over ceremony and departure was on 19th August. It was a momentous occasion especially as many senior politicians objected strongly to giving up part of the “home country”. With Sir Henry Norris now removed from Fulham politics except to do his duty in Parliament, and with Parliament not sitting, we lose sight of him for a while, for there is no formal record of when he was at Highbury, except when a journalist mentioned him. But we do know that on 23 August the seat that Sir Henry represented in the Commons chose their next MP: Sir Harry Greer. He was currently an MP for Wells in Somerset but now wanted to live and work closer to London. There were still stories circulating in the press that Sir Henry himself might move to another constituency, although it seems clear he had told his party that he was pulling out totally and nothing ever came of this. It appears to have been just rumour mongering. However at some time within the next few months Sir Harry himself pulled out of the chance to stand in Fulham on the grounds of ill health, and the local party was left back where it started. Sir Henry however would have been more interested in the opening of the new season, which began away at Liverpool on 26 August. If he did go I am not sure if he would have been welcomed, since it was after a previous trip to Anfield that he had pointed out the obvious match fixing that was going on. As a result Norris was firmly told off by the League and the Liverpool owners would have been laughing. But they were finally caught out – much to the embarrassment of the League who had reprimanded Norris so strongly. Arsenal’s team for the first match is shown in this table, indicating that with the opening of the season there were no new players in the line up. So as can be seen with the single exception of Clem Voysey this was an experienced team. Voysey had started the first game last season – as I note above – at outside left. But he had played centre half in his one and only game the season before – in the FA Cup. And he had played the first five games of 1919/20. Each time after getting his opening appearance he was not seen again – so was he going to survive this year? But perhaps more to the point was this: was this Arsenal team that had played much of last season good enough to survive this year? Certainly the crowd of 43,000 on 26 August for the league opener at Liverpool must have doubted it for after 45 minutes in the first league game of the season Arsenal were 0-3 down. In the end Boreham and Young got two back, but also in the second half Liverpool scored two more to make it 2-5. Not the start that was wanted. The second match, against last season’s third placed team Burnley on 28 August was a home 1-1 draw and already the changes were starting. Hutchins and Butler dropped out, Turnball and Baker came in. Young playing at centre forward got his second goal of the season. Sally Davis reports that Arsenal director Charles Crisp had some guests at the game including Joan Gamper, founder of Barcelona FC, and other friends from Cataluña. By the end of the month (although after only two games) Arsenal were 16th, but three of the teams below them had only played one game. Top of the league were Newcastle, the only team with two wins out of two games. For the third match on 2 September Arsenal faced Liverpool again – Liverpool having won one and lost one of their opening two games. Arsenal got revenge on the champions for that opening day hammering, taking a first half one goal lead and holding onto it for a precious two points, with 35,000 in the crowd – a good crowd for a Monday. This time Hutchins scored, having returned to replace Turnbull. But the difficult start in terms of opponents continued with the fourth game in a row against two of last year’s top three – Burnley away. As with the opening game Arsenal found it all too much and were 0-2 down at half time and ran out with another heavy defeat, 1-4. Hopkins came in for his first game, in place of Boreham, and scored the goal. Sir Henry Norris however didn’t attend the game. He went with Arsenal’s third team, now managed by Joe Shaw – a man who was to win the league for the club as manager, to Wealdstone. As the Islington Gazette reported, the reason was that Sir Henry opened the new football ground and dedicated a war memorial built to honour players at Wealdstone who’d died in the war. Next up on 9 September was Cardiff who had finished last season in fourth (did the fixture deviners do this to Arsenal on purpose?) Another away fixture and this time Arsenal scored first, but it ended in another away defeat of 1-4 – the third hammering in five games. Whittaker got the goal, but the changes to the team were not of the magnitude of last season. Only 14 players had been used thus far – and Voysey was still in the team! Then on 11 September came Arsenal’s issuing of its annual reports, and this showed a huge drop in the amount of money owed by the club. Arsenal were clearly making a profit, and if it is true that Sir Henry was keeping a lid on transfer expenditure as the manager later alleged, he was putting the resultant savings to good use. The debt to Humphreys Limited was now down to £317. That debt had stood at £16,000 in 1919 and we noted that one year before this report, it was down to £3541. So no question that Sir Henry was taking money out of the club – rather he was stabilising the club by repaying the massive debts that arose from building Highbury. We should also note that one year before, the club reported it had had taken loans of £18031 from shareholders and others to help see it through these early post war years. Now those debts too were down – an amazing drop to £5043. Yes there was still an overdraft of £14071 (mostly guaranteed by Sir Henry personally, according to later evidence he gave in court), but that made sense – overdrafts have always been the cheapest form of money, but that borrowing too was coming down. So Arsenal were not out of the financial woods yet, but the progress was little short of sensational. Back on the pitch despite two 4-1 defeats in a row Arsenal did win the next game on 16 September, 2-1 in the home game against Cardiff with a very decent crowd of 40,000 inside Highbury. Of note was the return of Dr Paterson at outside left for his first game of the campaign. However there was a shock for Williamson who had been such a fixture in goal since the resumption of football after the war, was not only not playing, it emerged that as Dunn and later Robson replaced him in goal, he had in fact played his last game for Arsenal after 105 games. He stayed at the club until the summer when he went to Norwich City (on 29 June 1923) and in 1923 got two caps for England – but by then he was not going to be playing again for Arsenal. In fact he played for England on 21 and 24 May 1923 in away games against Sweden. He then played two seasons in the Third Division (South) for Norwich and retired from football in 1925, having played 43 times for them. Arsenal.com assert that it was a free transfer. To make a little more sense of this I think we can guess that Sir Henry Norris encouraged the keeper’s move from Croydon Common to Arsenal after the war (when Croydon Common went out of business) as Williamson was one of the footballers who joined the Footballers Battalion which became part of the 17th Middlesex Regiment – that is the battalion formed by Henry Norris. Further I think we can assert see that the two summer England international matches would have been the “B” team, and his position in the squad may have been a recognition of his long service for Arsenal, and possibly the need to put an Arsenal player in the squad since Arsenal, despite their lack of trophies, was the club that European supporters knew above all others. (England “B” tours were fairly regular at the time – indeed it was one such to Australia that ended Tom Whittaker’s career as a player). So with this win over Cardiff with Hopkins making his first appearance of the season in goal, Arsenal now had two wins, a draw along with the three defeats in the league. On the plus side they had played three of last season’s top four home and away. On the down side the club had lost three games by three goals (away to Liverpool, Burnley and Cardiff). And there was the small matter that Arsenal were about to play the fourth of the top four teams from last season, home and away: Tottenham Hotspur. It would mean every single one of the first eight games of the season was against a top four team. On 23 September one of our missing men from last year – Graham – returned. He had played 21 times at centre half in the previous season but this season made way for Voysey. Graham however replaced Tom Whittaker at left half. Blyth returned at outside left. And with two goals from Boreham and a crowd of 40,482 at White Hart Lane Arsenal won 2-1. This game became notorious both for the roughness of the play and as a result of press coverage of the match with the allegation that the crowd at White Hart Lane unduly influenced a referee’s decision-making. Tottenham’s forward Walden went off injured after 10 minutes leaving Tottenham obviously a man short for the rest of the game. With Arsenal having come to play a defensive game (a fairly reasonable decision based on the position of the two clubs at the time) the Reds continued to hold a solid line at the back and play long balls up the pitch hoping to catch Tottenham on the break and exploit their one man advantage. And it worked, as having held the game at 0-0 at half time, Arsenal then went 2-0 up in the second half as Tottenham tired. But with ten minutes to go Tottenham got the ball in the Arsenal net. The referee disallowed it for offside but was then surrounded by the Tottenham team and was “persuaded” to change his mind. Arsenal obviously protested at this change in the decision, and as a brawl broke out on the pitch Alec Graham punched Tottenham’s Smith. A certain amount of uproar followed but the game was completed with no more goals. Arsenal had an away victory at Tottenham and in the space of two games had risen four places up the league away from an unwelcome proximity to the relegation zone. Of course the press felt this was the story of the week and spent much time mulling over the events as the FA began an enquiry – to which Sir Henry was of course called. But what made matters worse was that the League had continued with the policy it had introduced for the first time in 1919/20 of playing the home and away fixtures between clubs in consecutive matches for most of the season. As we have seen Arsenal had already played Liverpool, Burnley and Cardiff twice and now having played Tottenham at the Lane, the next match (with the fight on the pitch still the prime talking point of London football) was the return game at Highbury. The results of the enquiry by the FA are interesting indeed: Smith of Tottenham was found guilty of using bad language and suspended for a month. Let us just pause at that point – a month’s suspension for “bad language”. Now given that sentence you might be wondering what Graham got for hitting Smith. He got a censure for retaliation, and was warned about his future conduct. But no suspension. It was in fact the reverse of what we might expect today, and one might wonder why. The answer I think is “history”; the country had lived through the appalling slaughter of the first world war and violence of course is the heart and soul of wartime. But also in the military one does not swear at a superior officer. Hence bad language used against the ref was absolutely unacceptable while retaliation was understandable, although worthy of a warning. The swearing at a person in authority was the crime. Two working class men hitting each other was… well, everyday. Tottenham as a club were also warned about the behaviour of their crowd, and were warned of a ground closure if further trouble ensued. Order had to be maintained. And then, as with the way things worked with the fixture list, Arsenal now played Tottenham again, this time at home in front of 55,000 and … lost 0-2. The Arsenal team was identical to that of the week before, but Harry White, last season’s top scorer was injured part way through the game, leaving Arsenal’s rearranged remaining ten players finding it hard against a Tottenham team out for revenge. In his match-day programme notes for this game, George Allison, writing (as he had been since 1910 as “The Gunner’s Mate”), openly blamed the Tottenham crowd for the uproar at the end of the game at the Lane and said that items had been thrown from the crowd at Arsenal’s Blyth and Bradshaw. It was a long way from the sanitised niceties of 21st century programme writing. However despite Mr Allison’s comments and despite a new record crowd of 55,000 (beating the previous record of 50,000 December 1919 for the game against Chelsea), order was preserved in the return game on 30 September. Arsenal were thought to be favourites despite Tottenham’s good start to the season, not least because of Tottenham’s injuries and their man’s suspension, but reports suggested that Arsenal were being ultra cautious as if they had been warned by the club about their behaviour. Maybe that affected their performance. There was also one other change that resulted from these two games; the debate did start about whether it was a good idea to have teams play each other on consecutive Saturdays. No immediate decision was taken and the system continued for one more season, but finally in 1924/5 the League reverted to its previous policy of return fixtures for the most part being in the second half of the season. The only exception was for games at Christmas and Easter. Finally there was one more event that happened at this time: Sir Samuel Hill-Wood joined the board. This of course turned out to be a monumental moment for the future of the club, and I would love to know exactly why this happened but once again that lack of documents left by Sir Henry leaves us only with supposition based around what we do know. If you have been following this story in detail you will know that I have raised the issue of Sir Samuel before, as when in February 1920 as an MP alongside Sir Henry Norris, Sir Samuel singularly failed to support Sir Henry’s introduction of the Ready Money Football Betting Bill which Sir Henry presented to Parliament on behalf of the Football Association and the associations of Wales, Ireland and Scotland. The purpose of the bill being to make it illegal to distribute leaflets which advertised football betting schemes. Other members of Parliament who were known to be interested in football (but not Sir Samuel) all very publicly supported the bill. So what of Sir Samuel? We can see at once that he was a very different man from Sir Henry. While Sir Henry left school at 14 and became a clerk in the City of London, later making his fortune by building up his own property business in Fulham, Samuel Hill Wood was educated at Eton, and ran the family cotton business which he inherited. Sir Samuel was also a cricketer, being captain of Derbyshire for three seasons. In football he was also chair of Glossop North End, and thus would have met Henry Norris in the last two seasons before the war, when both clubs were in the second division. But while Sir Henry rescued, funded and made Arsenal profitable, Sir Samuel, having pushed for Glossop to be a league club (they were elected in 1898) threw in the towel and let Glossop sink, abandoning it at the end of the 1914/15 season. He remained outside football until this moment of his appearance on the board of Arsenal in 1922. In 1910, Sir Samuel was elected as an MP, and changed his name to Hill-Wood by royal licence in 1912. In the war he served in the Cheshire regiment and reached the rank of Major, and was given his knighthood in 1921, although I can’t see for what reason. 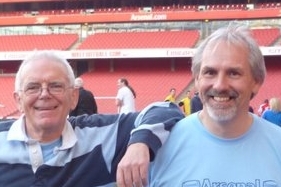 His son Denis and his grandson Peter both later became chairmen of Arsenal. So why did Sir Henry invite him onto the board? The board at this time still contained men from the earlier days of Arsenal – people like Jack Humble who were in essence working men who had bettered themselves in terms of their standing in society. It is possible Sir Henry wanted to have on the board someone else who had achieved (or gained as a result of the family heritage) a more elevated position in society. Perhaps even someone he could hand over the reigns to when he was ready to retire from football, as he was now planning to do from politics. It is also possible that the illness that we have noted Sir Henry suffering from had now made him determined to pull out of more and more of his work and devote more time to holidays and his family, and so he wanted a viable deputy chairman who would be at ease with the other public school educated men who ran the league clubs. We have indeed noted his long absence from England during his period of illness, and his withdrawal from many aspects of political life – now just serving out his time as an MP until the next general election. He and his wife had withdrawn from even the social occasions in Fulham, which had so occupied them in the past. I think also that his decision to miss a first team game in order to go the a third team match and open a new ground and a war memorial was telling. Lt Col Norris did not fight in the war, but he served his country in an extremely important way, being the man who more than anyone else I can trace, made first the pre-conscription registration processes work, then he conscription a efficient business and then later he oversaw demobilisation, another huge task. That was what took him from having no rank to being a colonel so quickly. No one else seemed capable of doing what he could do in administration. Now he was showing his business prowess by sorting out the debts accrued as a result of the move to Highbury – and doing that with astonishing speed. That was clearly his prime objective – winning things could wait until the debts were cleared. Indeed looking at Sir Henry’s absences from the club even after he returned from his illness, and his withdrawal from politics and local affairs I cant help thinking that he really wanted nothing else but to retire. And that I suspect is why he invited Sir Samuel to join the board – to take over once everything else was organised. And in fact the Hill-Wood family did take over, although not quite in the way that Sir Henry might have imagined. I think further evidence that Sir Henry had this vision of his future is to be found from the fact that towards the end of September he agreed to be interviewed by the Fulham Chronicle concerning his departure from the political world in Fulham. The interview appears across two issues of the newspaper, on 29 September and 6 October. The opening article started from the fact that Sir Henry had said that he was withdrawing completely from public life in Fulham – something that we can divine through tracing the history but which had not been made public before. He stated that he had been forced to stand down because of the demands of the local party, and the fact that he had received threats (as we noted at the time) as a result of his promotion of the out of Ready Money Football Betting Bill. The articles caused a sensation at the time, and subsequently many other newspapers asked Sir Henry for interviews, which he gave. However because of the way those interviews were written up it started to be assumed that he was leaving Parliament because his local party did not like the anti-gambling bill. Sir Henry later issued a statement to say this was quite false. Basically he was stating what has been revealed in these articles: he was not willing to accede to the demands of his local party for more money, and to be beholden to them for the way he voted in Parliament. He was, in short, breaking with the past, leaving himself free to concentrate on making Arsenal profitable and able to run without him. Arsenal were only one point and a couple of goals above a relegation spot, but it was early days, and as noted several times, Arsenal had played all eight games against the top four from last season. But we must also note that the League table was incredibly tight. Arsenal were three points above the bottom club – but then again only three points below the top club!